How does Santa fund his massive annual Christmas present operations? 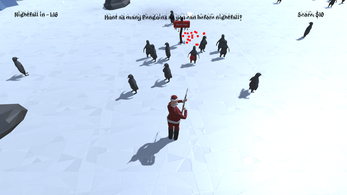 By hunting Penguins and selling their hides. 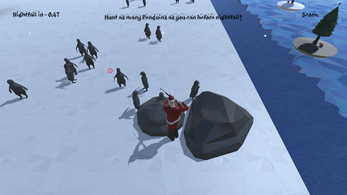 Play as Santa in his off-season and see much money you can make to fund next year's Christmas. This game was made in 48 hours for the 48 Secret Jam December 2017. I did all of the programming and audio, and the art was done by Nathan Wolfe. We ran into a fair few issues in development so this is not polished at all, and not very close as a game to the result we originally envisioned. None the less, we hope you enjoy. - Don't aim direction over the penguins, line up your aim with their direction. - The light does not reset when you reset the game. - Aiming issue when mousing over colliders. Extract the files to the destination on your computer of your choosing. An awesome use of funny themes and low poly.